If you live in your house long enough, the rooms go through several different transformations. This is especially the case for your kids’ rooms. One day you’re laying them down in their crib, and the next you’re wheeling that crib out and replacing it with their first big-kid bed. One of the biggest transformations comes when your child decides they no longer want a bedroom that looks like it belongs to a child. They’re a teenager now, and they don’t have time for childish things. 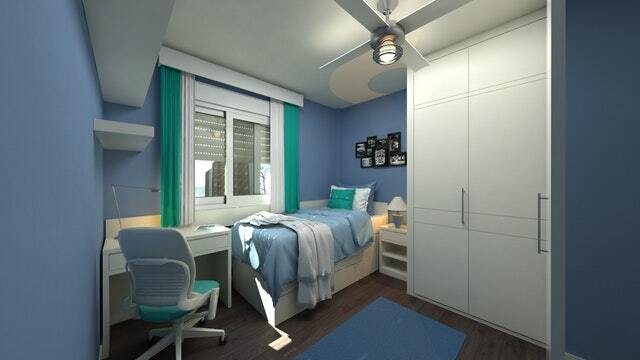 So how can you help them transition their bedroom from a kid’s room to one for a teenager? Here are a few suggestions. One of the first things you can do is help them remove some of the stuff from their childhood. You don’t want to throw these things away, but your child just doesn’t have space for them anymore in their room. So, grab some storage containers or some empty boxes, and start packing things up. Put away their old toys, clothes that no longer fit, and maybe even some of the decorations on the walls. Once you have everything safely packed away, you can store the boxes or containers in your basement, garage, or even rent out a storage unit. And when the time comes when they want to see these things again – and that time will come – they’ll be right there waiting for them. When your kid is young, you decide on all the decorations for them. You painted the room and hung up pictures of family around the walls. Now that they’re older, they are going to want a say in the matter. One of the biggest decisions you can allow them to make is the color of the walls. Take them to a local hardware store and grab some paint swatches. You can then decide together which color would look best. From there you can either paint the room on your own or hire some professional painters. After the walls are done, you can allow them to hang up what they want. Let them get some posters of their favorite bands or celebrities. Help them pick out some frames so they can hang up pictures of their friends. It might hurt to see that nice family photo you had up come down, but you can always find another place for it. Letting your child decorate their room helps them to feel like it’s really theirs. They’ll likely need some help with things however, so be ready to lend a hand hanging up shelves, installing mirrors, or moving furniture. Speaking of furniture, you may want to invest in a new furniture set for your teenager. Teenagers have different needs than kids, and they may have grown out of their current set. For instance, they may need a bigger bed now that they have grown. Or, since they’re getting more schoolwork, you may want to get them a nice desk at which they can do their homework. We know new furniture can be expensive but think of it as an investment. If you get good pieces, they will last your child for years to come. And, if they stay in good shape, you can sell them once they’re done with them. To save money, consider checking local garage sales or postings online for used furniture, provided it’s in good shape. Finally, the last thing you can do is stop treating your child’s room like a kid’s room. When they were younger, you were able to walk in at any time, or demand that they leave the door open. This isn’t going to work with a teenager. You need to give them some privacy and start remembering to knock before you enter. Doing so will show that you trust them and that this space is in fact their own. In order for this transition to go well, you need to work with your child. You can’t do it yourself, as you don’t know what your kid may actually want. And they can’t do it by themselves, as they likely don’t have the money or knowledge for this type of job. If done correctly, transitioning your kid’s bedroom into one for a teenager can be a bonding experience, and one that leaves your child feeling more adult. We know it’s a little bittersweet to have to go through this, but your child will appreciate the effort once you’re done.